Okay, so it wasn't much of a surprise, but Amazon finally has a tablet, and as expected its name picks up where the Kindle left off: Fire. Of course, rumors of an Amazon tablet date back to this time last year (if not before), but it seems that Jeff and co. have wisely chosen to get this thing out on the open market before having yet another wild and wacky holiday quarter. Bloomberg has curiously reported on some of the details before the event itself kicks off, noting that the 7-inch device will run a version of Android while acting much like a "souped-up Kindle." The real kicker, however, is the price -- at just $199, it's bound to turn heads, regardless of whether you were interested in a slate before. Naturally, that bargain-bin sticker explains the lack of an embedded camera and microphone, though consumers will find WiFi (no 3G, sadly) and a 30-day trial of Amazon Prime. It's also quite clear that Amazon's hoping to make a bigger splash on the content side of things than has been made already by Apple, and with the deals flowing like wine, we wouldn't be shocked if it does just that. Update: Itching for specs? How's about a 7-inch IPS (!) panel, Gorilla Glass coating, a 1GHz TI OMAP dual-core CPU, 512MB of RAM, 8GB of internal storage and a chassis that weighs 14.6 ounces. There's also access to things you'd expect to have access to: Android Appstore (though no access to Google's Android Market! ), Kindle books, magazines, etc. -- all stored for free via Amazon Cloud Storage. Per Jeff: "Delete it and get it back when you want." Oh, and Whispersync now works with movies and TV shows! "When you get home, switch to your big screen TV. Your movie will be right where you left it." While it's clearly Android underneath, the actual UI looks effectively nothing like it -- considering TechCrunch's intel that Amazon went and did its own thing without Google's blessing, we guess that makes some level of sense. Oh, and pre-orders are set to start today (but only for Americans... boo), with shipments heading out on November 15th. Update 2: We've added the first commercial video after the break. Update 3: Check out our hands-on impressions right here! Keep up with the unveiling at our liveblog of the Amazon event. (NASDAQ: AMZN)--Millions of people are already reading on Kindles and Kindle is the bestselling e-reader in the world for four years running. Today, Amazon is excited to introduce an all-new Kindle family: three all-new Kindle e-readers that are smaller, lighter, and more affordable than ever before, and Kindle Fire - a new class of Kindle that brings the same ease-of-use and deep integration of content that helped Kindle re-invent reading - to movies, TV shows, music, magazines, apps, books, games, and more. "We've now reached the magical two-digit price point for Kindle - twice: the new Kindle and Kindle Touch are only $79 and $99. Kindle Touch 3G is the new top of the line e-reader with free 3G - no monthly fees or annual contracts - and is only $149," said Jeff Bezos, Amazon.com Founder and CEO. "Kindle Fire brings together all of the things we've been working on at Amazon for over 15 years into a single, fully-integrated service for customers. With Kindle Fire, you have instant access to all the content, free storage in the Amazon Cloud, the convenience of Amazon Whispersync, our revolutionary cloud-accelerated web browser, the speed and power of a state-of-the-art dual-core processor, a vibrant touch display with 16 million colors in high resolution, and a light 14.6 ounce design that's easy to hold with one hand - all for only $199. We're offering premium products, and we're doing it at non-premium prices." Kindle Touch is a new addition to the Kindle family with an easy-to-use touch screen that makes it easier than ever to turn pages, search, shop, and take notes - still with all the benefits of the most advanced electronic ink display. Kindle Touch is also lighter, smaller, eliminates battery anxiety with extra-long battery life and holds thousands of books. Amazon invented X-Ray, a new feature that lets customers explore the "bones of the book." With a single tap, readers can see all the passages across a book that mention ideas, fictional characters, historical figures, places or topics that interest them, as well as more detailed descriptions from Wikipedia and Shelfari, Amazon's community-powered encyclopedia for book lovers. Amazon built X-Ray using its expertise in language processing and machine learning, access to significant storage and computing resources with Amazon S3 and EC2, and a deep library of book and character information. The vision is to have every important phrase in every book. Kindle Touch 3G is a new addition to the Kindle family for readers who want the top of the line e-reader. Kindle Touch 3G offers the same new design and features of Kindle Touch - small and light, easy-to-use touch screen, storage for thousands of books, and extra-long battery life - with the unparalleled added convenience of free 3G. Kindle's free 3G connection means you never have to hunt for or pay for a Wi-Fi hotspot - you simply download and read books anytime, anywhere in over 100 countries around the world. Amazon pays for the 3G connection so there's no monthly fee or annual contract. All Kindles have instant access to the Kindle Store with the largest selection of the most popular books people want to read. Millions of free, out-of-copyright, pre-1923 books are also available to read on Kindle devices, and Kindle customers can now borrow Kindle books from their public library. Kindle books are "Buy Once, Read Everywhere" - on Kindle, Kindle Touch, Kindle Touch 3G, Kindle Fire, iPad, iPhone, iPod touch, PCs, Mac, Android phones and tablets, BlackBerry, Windows phones, and web browsers with Kindle Cloud Reader. All three new Kindle e-readers also come with special offers and sponsored screensavers that appear when you're not reading. Customers enjoy special money-saving offers delivered wirelessly sponsored by AT&T, the Dove beauty brand and Amazon.com Rewards Visa Card by Chase. Kindle e-reader customers will also receive special offers in their own backyards from AmazonLocal, Amazon's local deals marketplace with discounts on local services, products, and experiences. 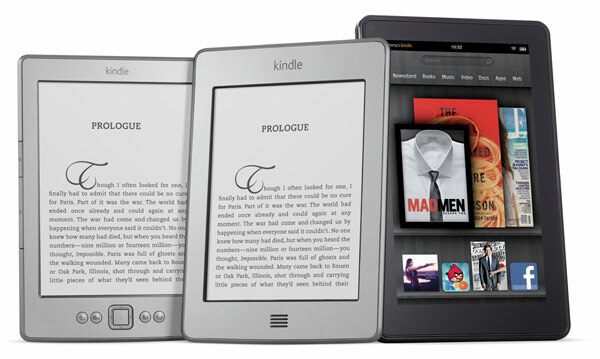 Customers can also choose to purchase a Kindle without special offers and sponsored screensavers. * Over 100,000 movies and TV shows from Amazon Instant Video, including thousands of new releases and popular TV shows, available to stream or download, purchase or rent - all just one tap away. Amazon Prime Members enjoy instant, unlimited, commercial-free streaming of over 11,000 movies and TV shows at no additional cost. Kindle Fire comes with one free month of Amazon Prime. * Over 17,000,000 songs from Amazon MP3, including new and bestselling albums from just $7.99 and individual songs from $0.69. * Over 1,000,000 Kindle books, including thousands of bestsellers, children's books, comic books and cookbooks in rich color. * 100 exclusive graphic novels, including Watchmen, the bestselling - and considered by many to be the greatest - graphic novel of all time, which has never before been available in digital format, as well as Batman: Arkham City, Superman: Earth OneGreen Lantern: Secret Origin and 96 others from DC Entertainment. * Hundreds of magazines and newspapers - including The Wall Street Journal, The New York Times, USA Today, Wired, Elle, The New Yorker, Cosmopolitan and Martha Stewart Living - with full-color layouts, photographs, illustrations, built-in video, audio and other interactive features are available from the new Kindle Fire "Newsstand." Kindle Fire customers will enjoy an exclusive free three-month trial to 17 Condé Nast magazines, including Vanity Fair, GQ and Glamour. * All the most popular Android apps and games, such as Angry Birds, Plants vs. Zombies, Cut the Rope and more. All apps are Amazon-tested on Kindle Fire to ensure quality and Amazon offers a new free paid app every day. Cloud-Accelerated Web Browser - "Amazon Silk"
The Kindle Fire web browser Amazon Silk introduces a radical new paradigm - a "split browser" architecture that accelerates the power of the mobile device hardware by using the computing speed and power of the Amazon Web Services Cloud. The Silk browser software resides both on Kindle Fire and on the massive server fleet that comprises the Amazon Elastic Compute Cloud (Amazon EC2). With each page request, Silk dynamically determines a division of labor between the mobile hardware and Amazon EC2 (i.e. which browser sub-components run where) that takes into consideration factors like network conditions, page complexity, and cached content. The result is a faster web browsing experience, and it's available exclusively on Kindle Fire. Additional technical details are available in the Amazon Silk press release, released today at www.amazon.com/pr. To see a video about Amazon Silk go to www.amazon.com/silk. Just like Kindle e-readers, Kindle Fire offers free storage for all your Amazon digital content in the Amazon Cloud. Amazon digital content is automatically backed up for free in the Amazon Cloud's Worry-Free Archive where it's available for re-downloading anytime. Just like Kindle e-readers, Kindle Fire uses Amazon's popular Whispersync technology to automatically synchronize your Kindle library, last page read, bookmarks, notes, and highlights across the widest range of devices and platforms. With the introduction of Kindle Fire, Amazon is expanding this technology to include video. Start streaming a movie on your Kindle Fire, and when you get home, you can resume streaming right where you left off on your TV - avoid the frustration of needing to find your spot. Content comes alive in rich color on a 7-inch full color LCD touchscreen that delivers 16 million colors in high resolution and 169 pixels per inch. Kindle Fire uses IPS (in-plane switching) technology - similar technology as used on the iPad, for an extra-wide viewing angle - perfect for sharing your screen with others. In addition, the Kindle Fire display is chemically strengthened to be 20 times stiffer and 30 times harder than plastic, which means it is incredibly durable and will stand up to accidental bumps and scrapes. Right out of the box, Kindle Fire users will experience the benefits that millions of Amazon Prime members already enjoy - unlimited, commercial-free, instant streaming of over 11,000 movies and TV shows with Prime Instant Video and the convenience of Free Two-Day Shipping on millions of items from Amazon.com. The all-new Kindle Fire - with all the content, Amazon's revolutionary cloud-accelerated browser, free storage in the Amazon Cloud, Whispersync, 14.6 ounce design that's easy to hold with one hand, brilliant color touchscreen, and a fast and powerful dual core processor - is only $199. Customers in the U.S. can pre-order Kindle Fire starting today at www.amazon.com/kindlefire and it ships November 15.